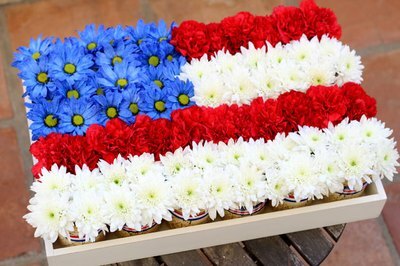 This Fourth of July, celebrate Old Glory with this unique red, white and blue floral centerpiece, in which flowers in mason jars come together to form the flag. Not only does it make a patriotic table decoration, the individual mason jar arrangements can be given away as party favors. Determine how many mason jars will fit in your tray. In my tray, I was able to fit 24 jars. These were the 8 ounce jelly jars. Then decide which section will be blue, and which rows will be the red and white stripes. 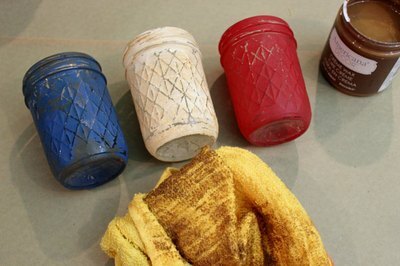 Paint each mason jar its designated color with chalky finish paint. Chalky finish paint, which you can find at hardware stores and some crafts stores, is ideal for glassware because it goes on easily without any primer. One coat is all you need. 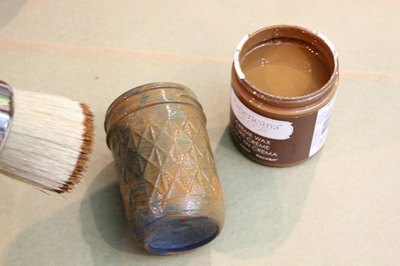 Distress the paint finish with a fork, scraping the sides to expose the diamond pattern of the mason jar. 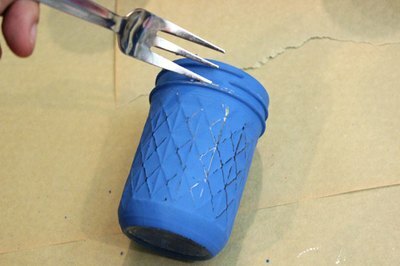 Drag the fork tines in various places to chip off more of the paint. Apply a layer of creme wax on top of the paint. The creme wax is specially formulated to seal the chalky finish paint, while giving it an antique finish. After you've applied the creme wax, wipe off the excess immediately with a clean cloth. The paint is now sealed, and the brown color of the wax remains in the grooves. Just like that, we have vintage mason jars. 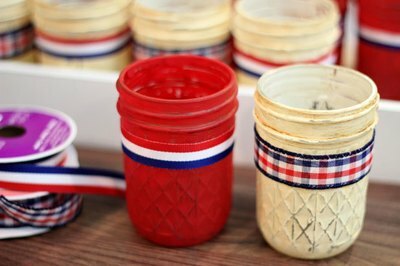 Wrap some decorative Fourth of July-themed ribbon around each mason jar, securing the ends with hot glue. Position the ribbon so it can be seen above the rim of the tray. 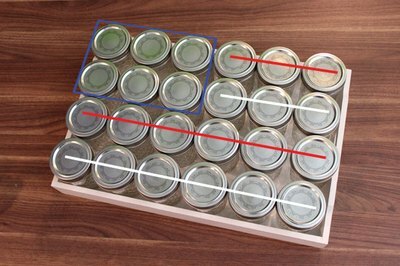 Place all the mason jars in the tray in their designated red, white and blue positions. Pour a little water in each jar. Then place blue flowers in the blue jars, red flowers in the red jars, and white flowers in the white jars. I selected blue mums, white mums and red carnations. On a practical level, mums and carnations lay flat, in contrast to more bulbous flowers like roses or tulips, which makes the flag design more clear. Cut all the flowers so they are all the same height, just above the rim of the jars. At the end of the party, invite friends to take home the individual mason jar vases. Guests can also use the mason jars as votive holders. 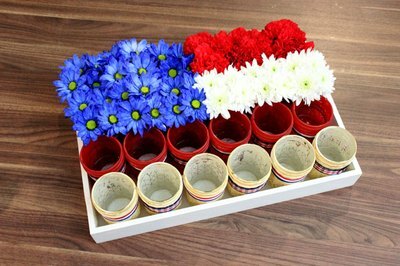 Place just enough flowers in each jar to create the flag design. 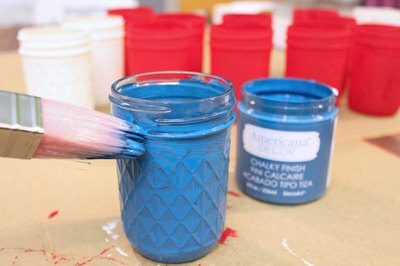 Overfilling the jars will result in a more muddled flag with stripes that are not straight. In this arrangement, the mason jars fit either two carnations or four mums.